When you set a goal, it should be challenging. Otherwise, what’s the point? If the goal is easily, quickly obtained, then it’s not a good goal. Don’t waste your time “working” to meet a goal that you can do with your eyes closed. When you’re going to go to all of the trouble of saying you have a goal, working towards it … make sure that it’s worth the effort so that when you get there, it’s going to be worth the effort to celebrate! 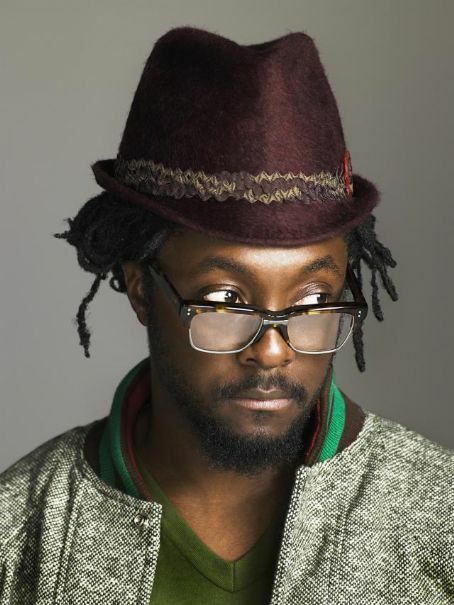 In business, it has been called a Big Hairy Audacious Goal. If you can get every member of your organization to buy in to a seemingly impossible goal … then you can achieve amazing things. What’s this got to do with the Ultimate Family Event, you ask? EVERYTHING! Our family tradition was to go camping every Memorial Day in the sequoias. There’s a pair of adjacent National Parks, the Sequoia National Park and Kings Canyon National Park, that are about 5 hours north of Los Angeles. Our family built big memories there. When we went camping one year, we had to set Lauren’s playpen up in a snowdrift (it is not warm in May at 7,000 feet!). Another year, the kids got their first (unsuccessful) fishing experience. We explored caves. We saw really, really big trees. Every year we did it, and every year it was great. The Mowry family, ready to GO! Kings Canyon National Park, 1995. 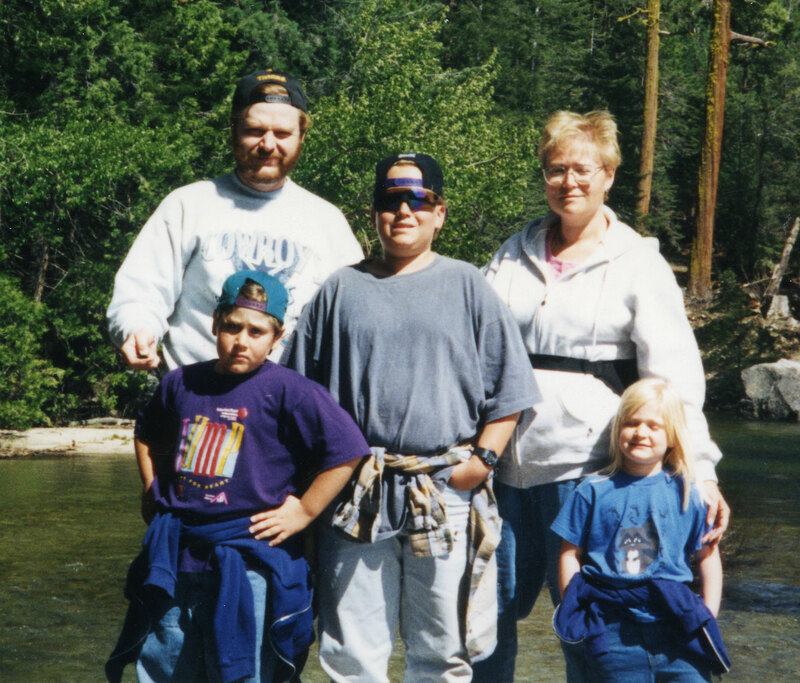 In 1995, I wanted the family to go hiking. By this time, Christopher was well into Boy Scouts, Michael was a Bear in Cub Scouts … and our Cub Scout Pack regularly went hiking locally. But it was our big annual vacation in the Sequoias, and I wanted to push the envelope. Two things happened during this vacation that became legendary in the family. The first was Velda’s immortal announcement during our first dinner, “Look at that big dog!” The “dog,” of course, was not a “dog,” it was a “deer.” And so began Velda’s reputation for, uh, having trouble identifying wildlife. The important thing that happened, though, was that we had a wonderful hiking experience. It was in Kings Canyon National Park, and it started, appropriately enough, at “Road’s End.” From there, we did a 9 mile loop hike to Mist Falls, which is the entrance to Paradise Valley. Sounds gorgeous, right? Yup. 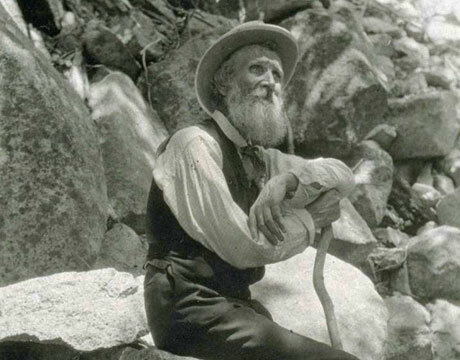 John Muir is famous for his love of and passion for the California wilderness. His packing advice couldn’t have been simpler: “Throw a loaf of bread and a pound of tea in an old sack and jump over the back fence.” I don’t think he was traveling with a 5 year old, however. Here’s the hitch: Lauren was 5 years old. 5 years old. 9 mile hike. At altitude. Really? Yup. Let’s reach for the stars. That was our family’s Big Hairy Audacious Goal. We began talking about this hike weeks in advance. The kids were always excited to go to the Sequoias, and were absolutely excited about the big hike we had planned. They wanted to go. They wanted to see Mist Falls. We were going to conquer a 9 mile hike, and we were going to do it together with a kindergartner. The morning went great. The forest was lovely, the trail very well maintained, the King’s River was splashing merrily along with snow melt. It was really a gorgeous hike. We had lunch on the granite rocks overlooking Mist Falls. And then it began to rain. We were about 4 miles from the car. This was a great mountain rain, with a quick temperature drop of 30* and grand claps of thunder in the thin mountain air that sounded like the world was ending. There were guys on the trail in shorts & a t-shirt that were fighting hypothermia as they ran for their cars … which were 4 miles away. “Road’s End,” remember? The Scouting motto was and is key to our preparation for family outings. Be prepared, indeed. We had layers of warm clothing, and we had ponchos for everyone. The temperature was not an issue, and the rain was not an issue. Except for our kindergartner. The poncho was actually too long for her short legs. She had to be very careful; it was often a trip hazard when walking uphill. 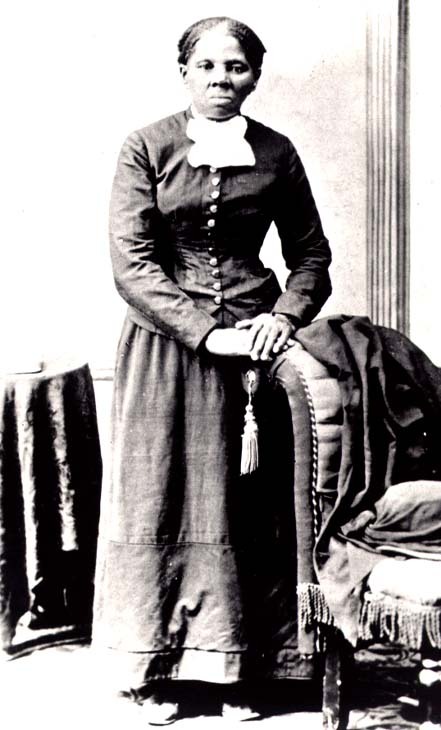 She had to hold the poncho up, or it would drag on the ground. No problem. She looked like a yellow ghost as she chewed up miles of trail in the rain. Did she hike 9 miles — 4 in the rain? Absolutely. There was never really a question in anyone’s mind, and the family achieved that big, impossible goal. 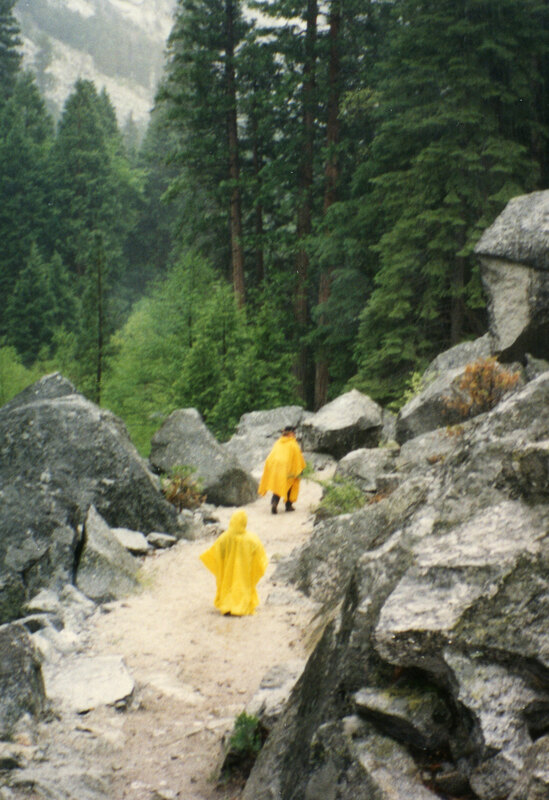 With poncho held high, the Mist Falls trek proved to be one of the best parts of this great family vacation in Kings Canyon National Park. This is a great post! Warms my heart. On the trail family portrait…priceless. Thanks.